Acrobat® MZ 690 has protectant and anti-sporulant activity against downy mildew on onions, grapes and lettuce, late blight on potatoes, and protectant activity against early blight on potatoes. Acrobat MZ 690 combines the locally systemic, translaminar properties of dimethomorph with the protective properties of mancozeb. Acrobat MZ 690 should always be used as part of a protective spray program and applied before disease symptoms appear. No cross-resistance with phenylamide resistant strains of fungi have been observed with Acrobat MZ 690. 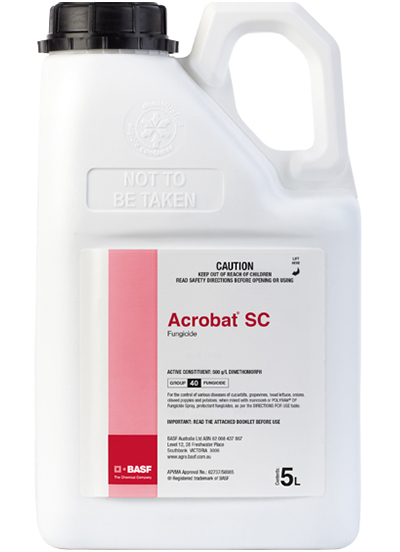 To prevent or delay the onset of fungicide resistance, it is recommended Acrobat MZ 690 be used in spray programs including fungicides with different modes of action.